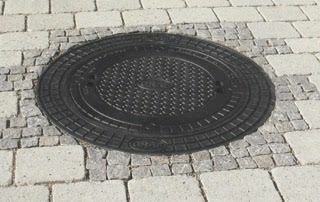 Grated Lid Class B Trafficable Lid for use when tanks are put under driveways. Li-Lo Rainwater Underground Tank with the PE cover may only be installed in traffic free areas. The amount of short-term load of the PE cover is max. 150 kg, the long-term area load max. 50 kg. Li-Lo Rainwater Underground Tank with the cast iron cover (Class B) and cement support ring are suitable for installation in light traffic areas (max. total load 3.5 ton). The tanks are not to be installed in areas where heavy goods vehicles are driven. The areas driven by light traffic must have a compacted earth covering of not less than 700mm and a maximum of 1000 mm. Under no circumstances is the load caused by vehicles to be transferred to the tank.